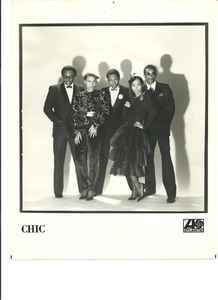 Formed in 1977 by Bernard Edwards (October 31, 1952 – April 18, 1996) and Nile Rodgers (born September 19, 1952), Chic are widely considered to be one of the most creative and innovative bands of the 'Disco Era'. Current line-up: Nile Rodgers (guitar, vocals), Jerry Barnes (bass, vocals), Ralph Rolle (drums, vocals), Kimberly Davis (lead vocals), Folami (lead vocals), Richard Hilton (keyboards), Russell Graham (keyboards), Bill Holloman (horns), Curt Ramm (horns). On June 16, 2011, Chic gave a concert in Paradiso Amsterdam. I was standing pretty close in row 8. Just before the concert Nile came out to have look at his audience. With his camera he made pics of his longtime fans. They opened with Everybody Dance. All their great songs past the revue, like Dance Dance Dance, I Want Your Love, Le Freak and Good Times. After 2 songs he stopped to talk about Bernard. It is almost the 15th anniversary of him sadly passing away. Every April they travel to Japan to commemorate. An emotional moment for me and i'm sure for everybody. Next were the songs written by him for Sister Sledge (We Are Family), Diana Ross (I'm Coming Out & Upside Down), Sheila & B. Devotion (Spacer), Madonna (Like A Virgin) and this time they even played David Bowie's Let's Dance, which sounded very cool. Chic Cheer and My Forbidden Lover we're also great. Nile just recovered from cancer, unbelievable he was standing there, still sounding very smooth, slick and funky. The Chic Organization is a great band. We know how difficult it is, to let this music sound good live. They also played the lesser known Soup For One, Hangin' and the instrumental Open Up. Oh yes, and let's not forget 2 other of my favorite songs, He's The Greatest Dancer and Thinking Of You. All the above mentioned songs are either written or produced by Bernard Edwards & Nile Rodgers. Great stuff. He mentioned Bernard a second time. Mr. Jerry Barnes formerly Juicy takes his place and is doing very well since we know how difficult some of their songs are on Bass. Bernard's spirit floats amongst them and is still present. Yes, time flies. Let's try to enjoy it. I did enjoy it very much. Maybe he'll be back sometime. Nile knows Holland loves him and i hope he'll be back for yet another fantastic evening with Chic!